Radar backscatter at 50 MHz, rocket, and VHF/GHz scintillation measurements of spread F irregularities at the magnetic equator in Peru were made during the Project Condor campaign in March 1983. 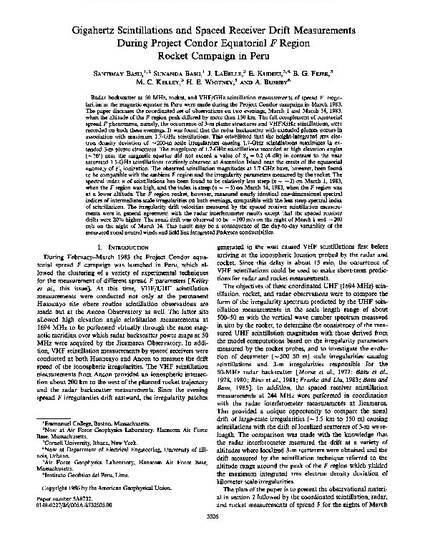 The paper discusses the coordinated set of observations on two evenings, March 1 and March 14, 1983, when the altitude of the F region peak differed by more than 150 km. The full complement of equatorial spread F phenomena, namely, the occurrence of 3-m plume structures and VHF/GHz scintillations, were recorded on both these evenings. It was found that the radar backscatter with extended plumes occurs in association with maximum 1.7-GHz scintillations. This established that the height-integrated rms electron density deviation of ∼200-m scale irregularities causing 1.7-GHz scintillations maximizes in extended 3-m plume structures. The magnitude of 1.7-GHz scintillations recorded at high elevation angles (∼76°) near the magnetic equator did not exceed a value of S4 = 0.2 (4 dB) in contrast to the near saturated 1.5-GHz scintillations routinely observed at Ascension Island near the crests of the equatorial anomaly of F2 ionization. The observed scintillation magnitudes at 1.7 GHz have, however, been found to be compatible with the ambient F region and the irregularity parameters measured by the rocket. The spectral index n of scintillations has been found to be relatively less steep (n ∼ −3) on March 1, 1983, when the F region was high, and the index is steep (n ∼ −5) on March 14, 1983, when the F region was at a lower altitude. The F region rocket, however, measured nearly identical one-dimensional spectral indices of intermediate-scale irregularities on both evenings, compatible with the less steep spectral index of scintillations. The irregularity drift velocities measured by the spaced receiver scintillation measurements were in general agreement with the radar interferometer results except that the spaced receiver drifts were 20% higher. The zonal drift was observed to be ∼100 m/s on the night of March 1 and ∼200 m/s on the night of March 14. This result may be a consequence of the day-to-day variability of the measured zonal neutral winds and field line integrated Pedersen conductivities. Basu, S., Sa. Basu, J. LaBelle, E. Kudeki, B. G. Fejer, M. C. Kelley, and H. E. Whitney, Gigahertz scintillations and spaced receiver drift measurements during project Condor equatorial F-region rocket campaign in Peru, J. Geophys. Res., 91, 5526, 1986.